Happy New Year! With regards to Susan’s post on the final day of 2013, I appreciated the chance to reflect on my experiences and accomplishments of the past 12 months. I have already learned so much from my peers, my courses, and through work in the Cyberlab. 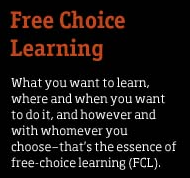 I am looking forward to 2014 as it will be full of hard work and additional opportunities to build personal and professional skills while I conduct research in the field of free choice learning. One area I am excited to continue studying are strategies and methods of communicating scientific information to the public. At the Visitors Center we are always striving to improve our exhibit design, and our personal methods of interpretation while interacting with visitors. We critique what we say and how we say it whether it is on exhibit signage or in conversation. Effective communication, particularly the translation of technical information to a diverse audience, is a skill that takes practice. The challenge is communicating the information in a way that is inclusive and avoids confusing jargon. Other members of our lab have discussed the value and elements of science communication through the blog and I am seeing more of these conversations occurring within the scientific community online. As scientists and researchers, we are attempting to answer questions and understand natural phenomena. Why would we want to keep that information to ourselves? Are scientists motivated to share their work beyond formal conferences and peer-reviewed journals? With regards to the previous question, there is evidence that indeed scientists want to share their work with a wider network. For example, more and more researchers are writing blogs and using social media channels to showcase their findings. I recently joined Twitter and following #scicomm has been a valuable resource for me as I learn about this topic. The discussion covers many areas — whether scientists should be trained in graduate school on effective communication strategies, to which channels are most effective (Twitter vs. Facebook), to making connections and advancing research. I am interested to follow how the the relationship between social media and science progresses. As future generations enter the field of research, how will the value or use of peer-reviewed journals and social media platforms evolve? In future posts I will discuss social media and science, and other examples of how scientific content is shared in unique ways online. Of particularly interest to me are infographics, which represent complex data and information using graphic design techniques. Posted in Outreach, Science Communication, scientists.